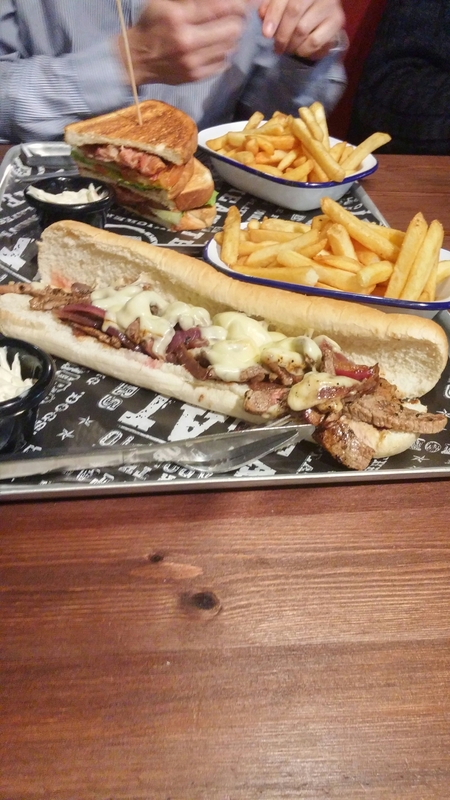 The Smoke Haus is a Swansea based operation that has recently opened up in Cardiff offering American staples in the form of burgers, dogs, sandwiches (as in po boys, cheese steaks etc) and BBQ ( ribs, brisket and pulled pork). All the sort of stuff that usually gets my taste buds tingling. 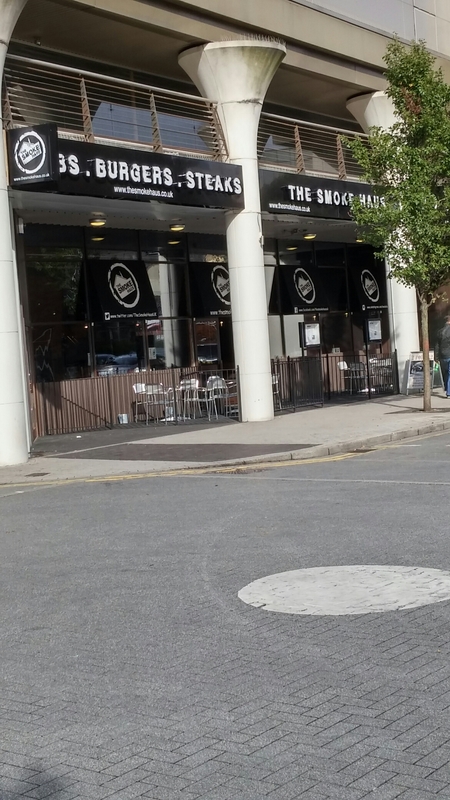 It is situated in a graveyard of a location for restaurants in Cardiff, where the defunked Hooters and after that the Sports Cafe experienced (both selling similar fare to that now on offer at the Smoke Haus) slow and painful deaths. 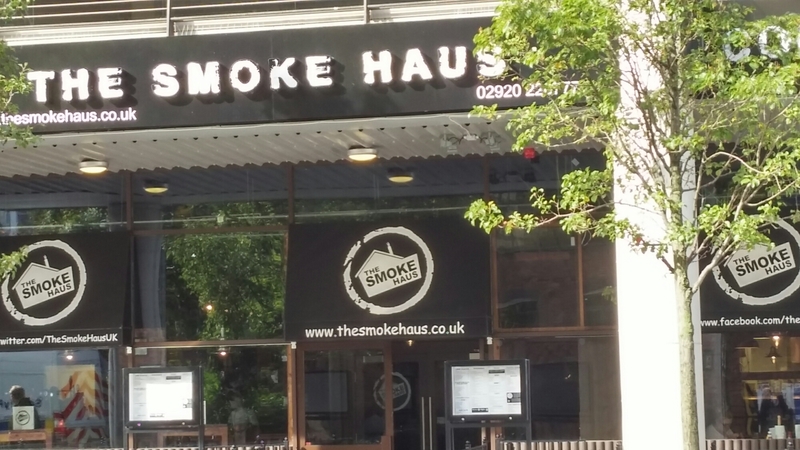 Will the Smoke Haus be different I wonder? Well it will have the advantage of Admiral Insurance’s shiny new headquarters just around the corner so (once they move in) there will definitely be more passing traffic, but these days a place’s food generally needs to be up to scratch to survive (there are some notable and inexplicable chain exceptions to this rule, mind). To check this out, three mates from work and I gave it a go one lunch time. The inside is quite unassuming (with some token Americana on the walls and American sport on various TVs) and it is a big old space. Not sure how many covers it has, but it is a lot. Whilst there were actually a few people in on the day we visited (a Monday lunchtime is to be fair usually a slack time) due to its size it did seem very empty (tumble weed would not have looked out of place). As seemed to be the theme (bigger is better) of this place, the menu (called the Haus Bible) was massive providing for a myriad of choices. Some of the offerings in the Haus Bible are more appealing than others. A burger utilising a glazed ring doughnut in place of a bun definitely does not float my boat and just thinking about the gut busting “classic” menu item called the “Big Bertha” (5 x 8oz cheeseburgers, with jalapenos, bacon, fried onions and burger sauce in a bun plus fries and slaw for £25.95 – I assume the intention is for this to be shared between more than one person but seriously!!!) 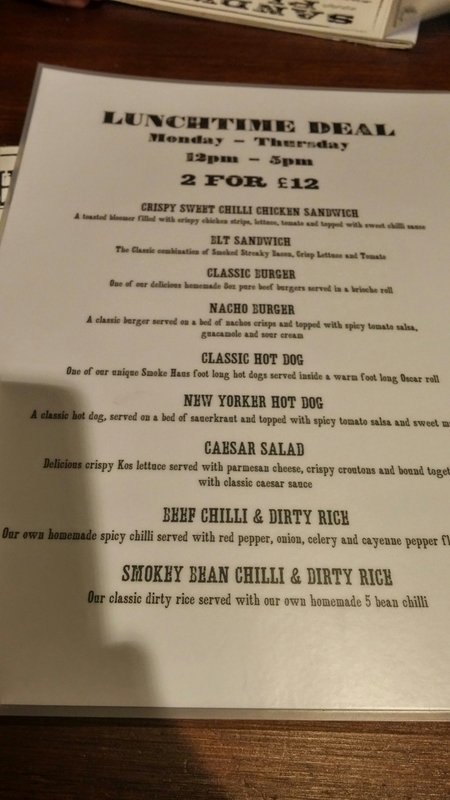 makes me feel ill.
For the budget conscious there is a lunchtime offer of 2 meals (from a limited list) for £12 (available 12 – 5pm Mon to Thurs). What I got was OK, but nothing more, and had a number of flaws. While advertised as containing “wafer thin top side of beef”, the beef came in quite thick strips. As said beef was topside (not the cut of beef I would have used, especially if not actually cut wafer thin), these strips were more than a little chewy. The cheese used was emmental which was a touch on the bland side. 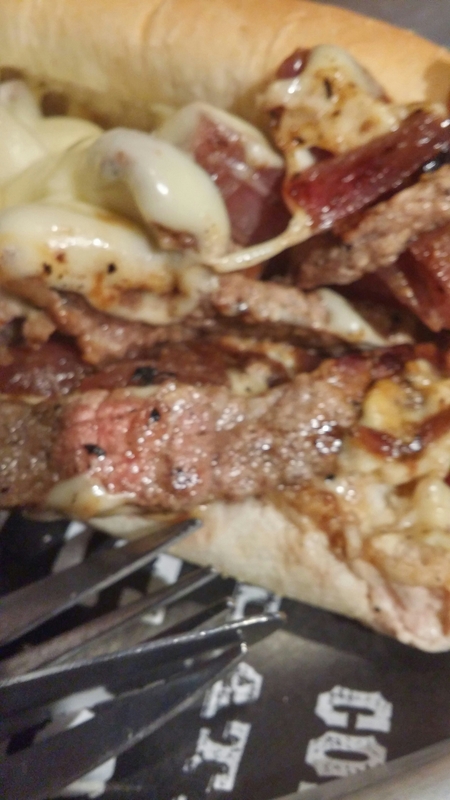 It had also started to resolidify when I got my sandwich and this (added to the chewiness of the beef) made for quite a rubbery texture overall. The hoagie roll it came in collapsed on picking it up making it impossible to eat without cutting it into smaller chucks. The meat itself didn’t taste of much, but as least it didn’t have that liverish taste you sometimes get from beef at the lower end of the quality scale. My chips were plentiful and OK, but looked and tasted cooked from frozen rather than hand cut and freshly fried. They didn’t seem to be skin on as stated on the menu, didn’t come in a bucket (as advertised – not that I really cared) and could have been a tad hotter. As for the slaw, the less said about that the better. Contrary to the jumbo everything theme, the pot of this was tiny and hardly worth the bother. It consisted of one small forkful of overly vinegarly cabbage mixed with mayonnaise and seemingly naught else. As a whole, it certainly was a big portion, but to be honest I would have much preferred better quality ingredients and a smaller portion size to what I got. 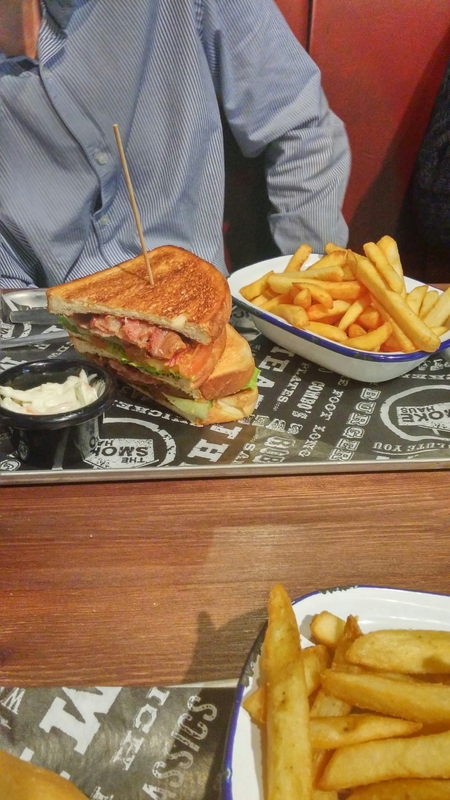 Others on the table had a toasted BLT (£6 as part of 2 for £12 lunch offer), a New Yorker Hot Dog (again £6 as part of 2 for £12 lunch offer) and the classic burger with cheese (£8.70). All came with the same fries and slaw as my cheese steak. 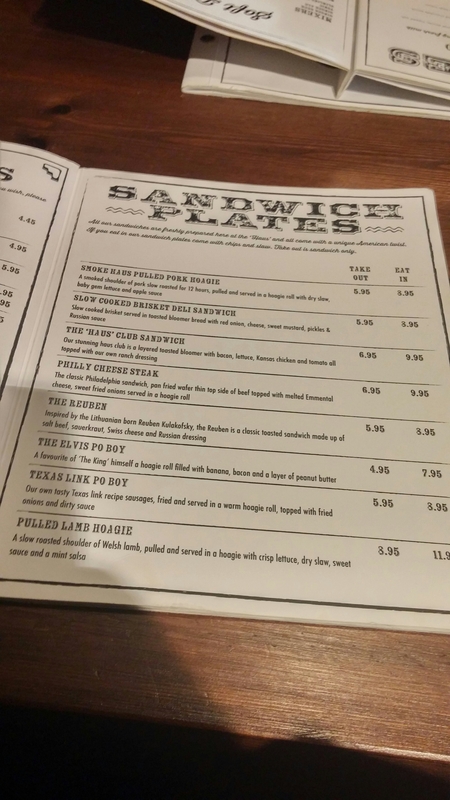 The BLT sandwich (toasted) was pronounced as perfectly fine and there is nothing else I can really add to that – it looked OK to me. 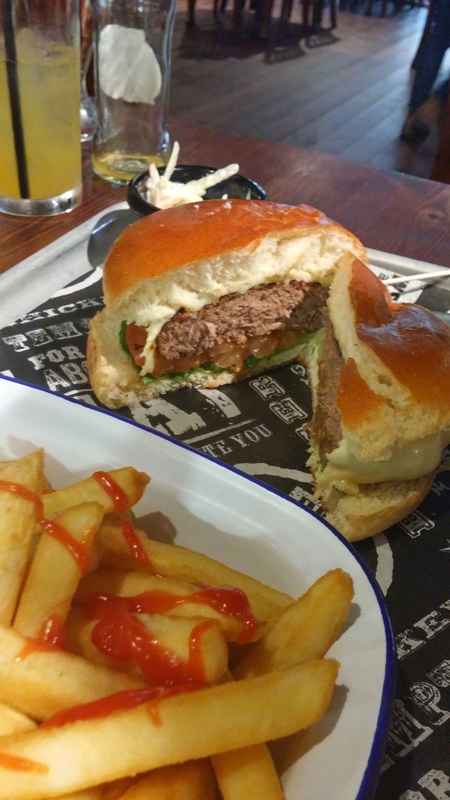 The burger was also stated to be fine and quite tasty. I didn’t try it, but to me the texture look quite solid (suggesting a pre bought pattie rather than a homemade one) and the bun looked a little bit dry. No question was asked as to cooking preference for the burger pattie and it came resolutely grey – medium to well done. I assume they don’t cater for those (me) who prefer a bit of pink in their burger. 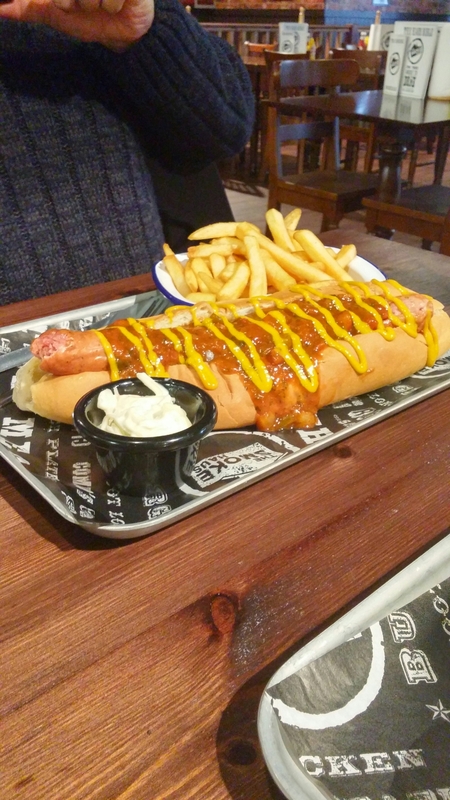 The hot dog was a monstrous beast of a thing and, like my cheese steak, tricky to eat without a knife and fork (heresy for a dog in my opinion). I didn’t taste the dog (to be frank – terrible pun sorry – it didn’t look that appetizing), but did try a bit of the salsa liberally slathered on top of it. This was quite synthetic in taste (comes in industrial size cans I suspect) and not my cup of tea at all. When asked by me what it was like as a whole, the response was a “it’s OK, I suppose” which is damning with faint praise if ever I heard it. On the plus side, sort of, it could have easily fed 2 people and on the basis of the 2 for £12 offer you could fill up four people for £3 a head should you so wish. On the drinks front, they seem to have a good range of craft beers (even getting a mention in a Guardian piece on craft beers in Cardiff), as well as a decent selection of bourbons. It was a working day so no booze for us at lunchtime and the selection of soft drinks was less promising. It comprised 3 shakes, a few juices and sodas, but nothing to excited non booze drinkers. I went for the Oreo milkshake (£3.50), which I had hoped would be as good as the shakes at Atomic Burger (sans the bourbon) in Bristol. 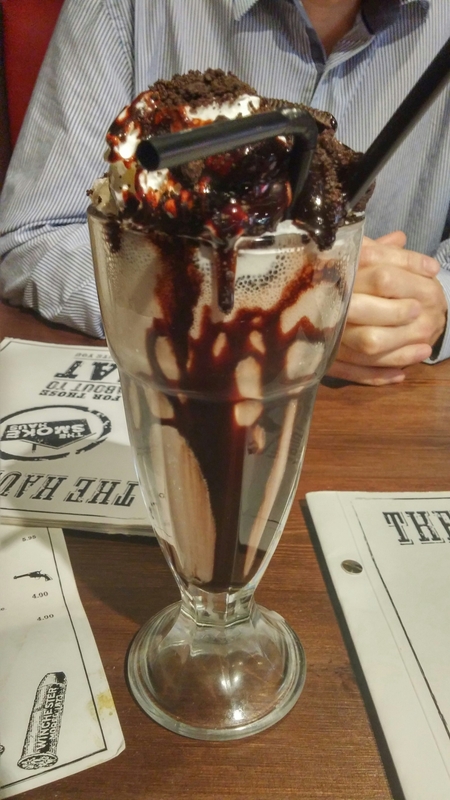 It was regrettably a nesquik clone (blandly flavoured and thin) to which far too much whipped cream had been added (meaning only half a glass at best of actual shake), as well as a not very good chocolate sauce and some crushed Oreos. All in all a bit disappointing shake wise. As stated above, they do BBQ staples (brisket, ribs, pulled pork) and whilst our choices didn’t stray into this aspect of their menu (portion sizes making anything BBQ related too much for a week day lunch, for us at any rate), I can’t say the non BBQ offerings have given me much hope that the BBQ stuff would be anything more than adequate at best (but I could be wrong). On the service front, the people who dealt with us did so efficiently and with a smile. The Smoke Haus was pretty much as I suspected it would be. Whilst not awful, there wasn’t really anything to write home about food wise. It (to me) sacrifices quality in favour of quantity. As the title suggests, bigger isn’t always better when it comes to a plate of food. Small and scrumptious trumps big and bland everytime in my book. If, however, masses of edible (but nothing more) food is your thing then this is the place for you (fueling up before a beery night out perhaps). 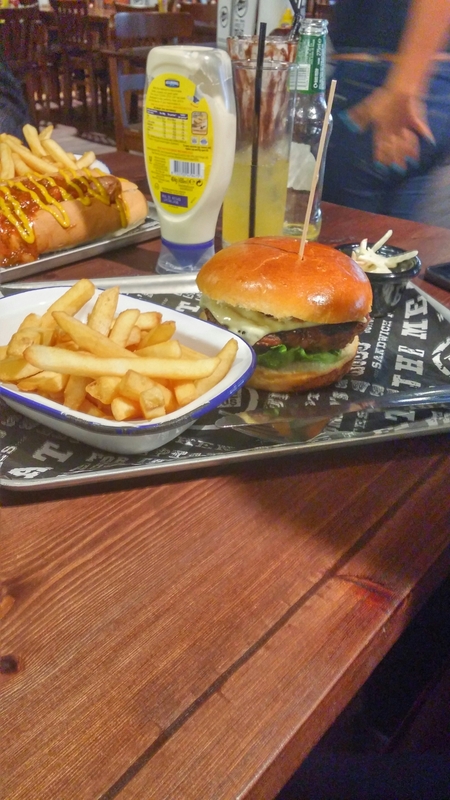 I on the other hand prefer quality to quantity and there are plenty of places in Cardiff which do the sort of stuff the Smoke Haus does, but better. 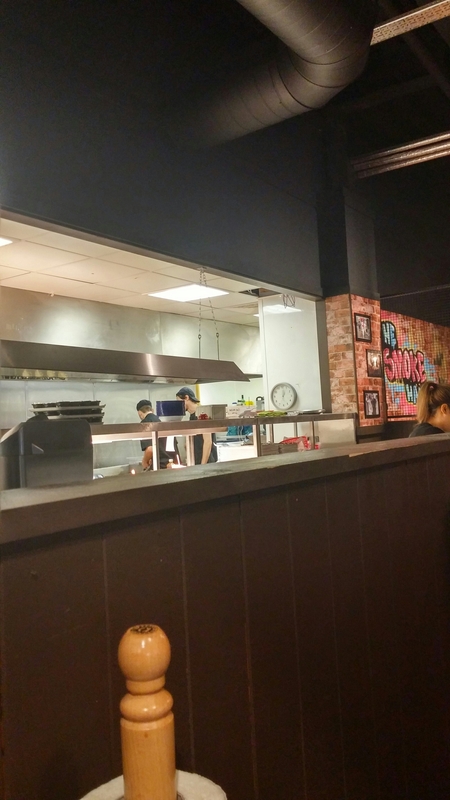 Think the Urban Tap House, Brewdogs, the Grazing Shed, Got Beef and, on the BBQ front, the incomparable Hangfire Smokehouse. Would I go back? No I don’t think so, but some people must like it as positive reviews far outweigh the negative ones on Tripadviser (although some of the negative reviews are somewhat brutal). 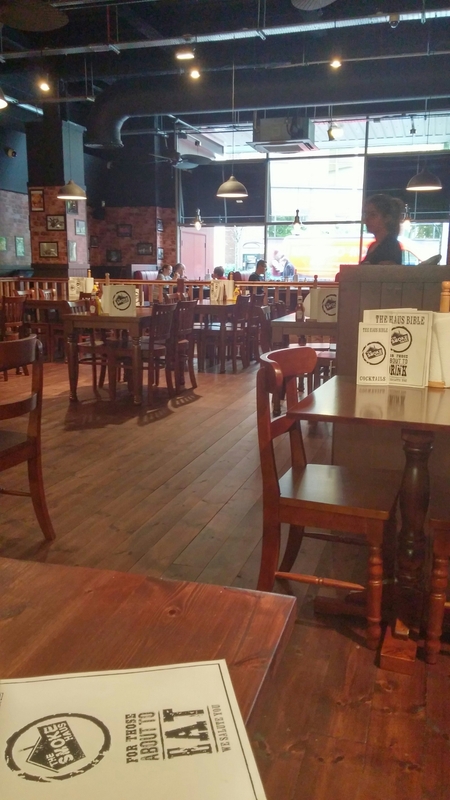 This entry was posted on Oct 19, 2014 by solicitingflavours in BBQ, Burger, Cardiff, cheese, Drink, Fixed Price Menu, Food, hot dogs, lunch, lunchtime, Non alcoholic drink, Restaurant Review, Take away, Wales.